On to the post then, and it's been an exciting time for the hairdressing industry, as more and more people want extravagant and flamboyant colours in their hair. Hairdressers have always been colouring hair, but it seems that these unnatural colours are filtering out in to the mainstream. This all makes me miss the hairdressing industry actually, back in my day *shakes walking stick* it was all about highlights, lowlights and the old dears coming in for their shampoo and sets. Any unnatural colours in stock were exclusively from Fudge - how times change! I've had lilac hair for about 9 months or so, and I was starting to get a little bored. I also noticed more and more people going lilac and felt like the time was right for another change. I could see what the next big thing was going to be. I did my research online and bought in all the products I'd need. I was going grey / gray - because why not?! The research was actually quite tricky. Directions, my usual first port of call for unnatural colours, don't have a grey. They have a Silver, but that has a tendency to turn the hair blue-ish, and they also have Ebony, a deep black which if diluted could give me the results I desired. So I gave it a shot, added a miniscule amount to a massive dollop of conditioner to dilute it and tested it out on a few random sections of my hair. This was a complete fail though, it left my hair looking blue-toned instead of grey and after just a couple of washes, it turned a weird silvery-green. I decided at this point that dilution was not the way to go. The products are those two things in the middle, not the plants. What I find fascinating about these two products is they've taken two completely different routes to try and get to the same result. 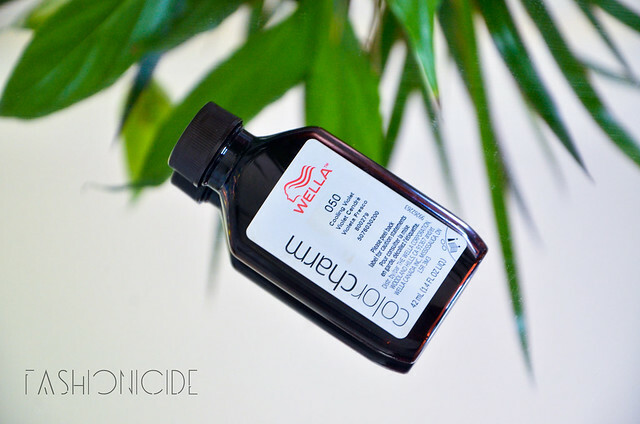 Wella's Color Charm in 050 Cooling Violet is peroxide based, and is claimed to be permanent. 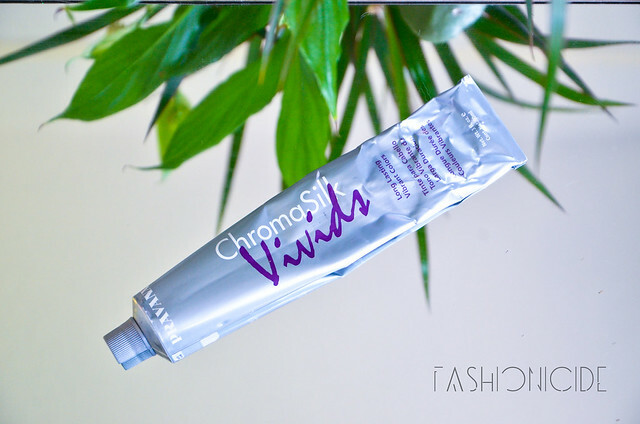 Whereas Pravana's ChromaSilk Vivids in Silver is not too dissimilar to Directions, you can just apply it straight to the hair without developer. I'm definitely a fan of Wella, particularly their professional ranges. I'm completely biased though, as I practically 'grew up' as a hairdresser on Wella's Professional products. My college and the salon we ran was pretty much exclusively Wella, and everything I know about hair comes from that time, so Wella are pretty much the benchmark I compare everything to. Wella claim that Cooling Violet is a permanent colour, but as I'll describe down below, that's not the case for anyone that has bleached, porous hair! Looking at the picture above, you'll notice the bottle looks pretty small, and you can see it's just 42ml. So what is it, and how do you even use it? 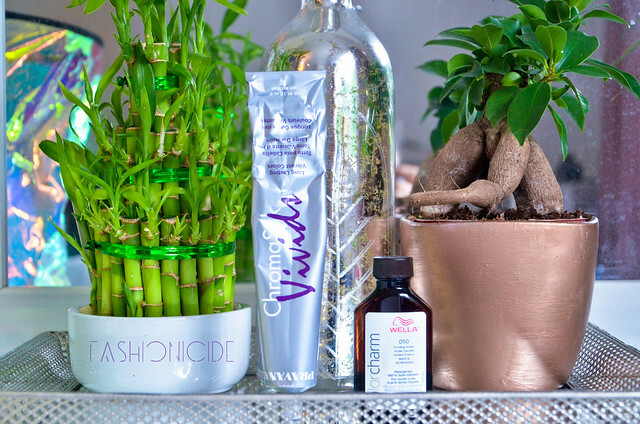 Simple, you need to mix a 2:1 ratio of Peroxide to Wella Colour Charm Cooling Violet. I used a low strength developer - just 3%. Why? Because when you're going darker, a low strength peroxide will not lift your hair up as much as a higher strength one - it just doesn't make sense to damage your hair any further, by taking it lighter, when you're just going to make it darker again anyway! Because my hair is already coloured almost all over (bar the roots), all I needed to do was go through the bleaching process for the roots (LINK to the bleach I use), and afterwards apply the Cooling Violet all over my hair. I have to mention though, I ended up skipping the toning process. I'd normally use Wella's Colour Charm T18 White Lady after bleaching to knock out all of those brassy tones, but this time around I just couldn't see many. This was most unusual, but my theory is that I forgot to saturate my hair on Coconut Oil prior to bleaching. Coconut oil acts as a barrier to protect your hair, but also must prevent the hair from lifting as much by slowing down the bleaching process. After this success, I think I'll avoid applying the coconut oil ahead of bleaching in future! But I digress, the Cooling Violet is actually supposed to be an additive to the likes of T18 White Lady, but to me that didn't really make sense in this case. You'd usually want to lift with White Lady and then go dark with Cooling Violet, so I didn't bother mixing the two. I just mixed the 1 part Cooling Violet with 2 parts 3% peroxide, applied to damp hair, all over the roots and ends and left it on for 30 minutes. Looking in the mirror, my hair looked jet black! Not to worry though, I then proceeded to rinse it all off and conditioned. Once the hair had dried, it was a steel-looking grey. Perfect. Sort of. After just a couple of days, the steel-like colour was fading fast. I found this to be really annoying, look how much pain we put our hair through only for the 'permanent' colour to fade in less than a week! To make matters worse, it was fading into a Silver colour with a greeny/blue algae-like hue which looked disgusting. 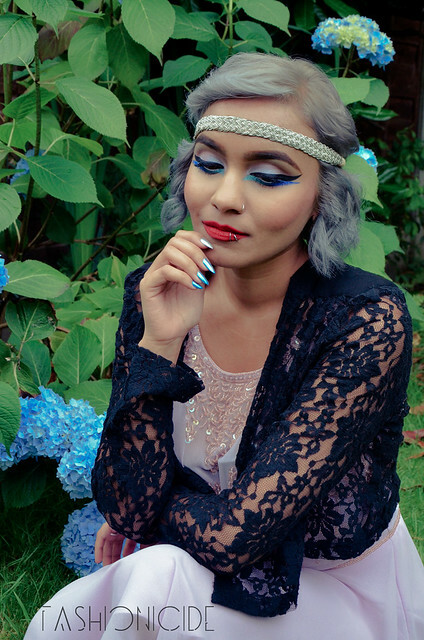 As much as I love silver hair, the hue was sickening - a bit like Directions Ebony, ironically enough. Even if Wella's Colour Charm 050 fading process left me with pure silver locks, I'd only use it after bleaching my roots, mainly because it does work wonders with those brassy tones. However, using a peroxide based anything will just damage your hair further. So why didn't the permanent hair colour last? Going back to my old college days, it's all about the molecules. Permanent colours have smaller molecules which are easily deposited into the hair. However, if you have bleached hair, your hair is much more porous so those smaller molecules are easily washed away. If you have naturally light hair, I imagine that this would last much, much longer. If you've had to bleach your hair down though, it's next to useless. Obviously after the Wella failure, I was a little bit annoyed - at the product, at the colour of my hair and at myself for not realising it was destined to fail! 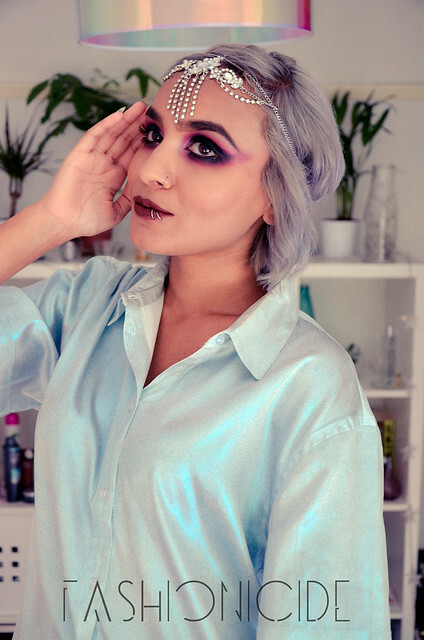 At this point I found Pravana's ChromaSilk Vivids in Silver, and thought I might be on to something here. For starters, it doesn't require peroxide - it's similar to Directions or Manic Panic in that you can apply it straight to the hair for an intense colour, or dilute it to get those lighter tones. After the grey had faded from Wella's Color Charm 050, I mixed a little bit of Pravana's Silver Vivids into a bowl with lots of white conditioner. I then applied it all over the hair and left it on for just 30 minutes. After a good rinse, it had left me with grey hair, in fact it looked exactly the same as Wella's Cooling Violet. There was literally no difference between the two, and that made me a little bit nervous! As you'll see below, there really wasn't any need to be though. Before I show you the pictures (if you don't just skip down to them straight away! ), I'll have to admit to having only used this just once, but that's because the colour lasts so long! The fading process has been surprisingly good, each stage just seems to get better and better. 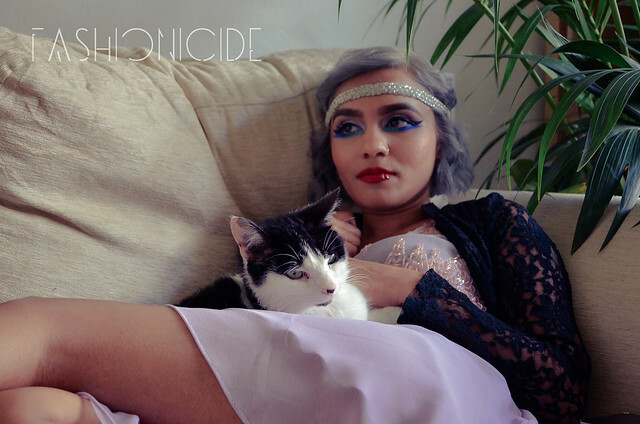 On that basis, I'd recommend Pravana's ChromaSilk Vivids Silver over Wella's Color Charm 050 any day of the week. I'd only recommend using the Color Charm if you have brassy tones after bleaching, but certainly not for long-lasting silvery-grey hair. My hair no longer looks all-out grey. If anything, it's more an ever-so-faint-purple-toned silver. In certain lights, I do catch a slight grey hue, but in perfectly natural lighting, it just looks like a smokey kind of silver. I can't quite put my finger on it, but it looks fantastic. In the picture above, you can see that after three whole weeks I'm just starting to see those faint brassy tones peeking through. Whilst it's not ideal, it's certainly turning out an awful lot better than when I'd bleach my coconut oil saturated hair. So, do I love the grey hair? No. It's not for me. It looks so flat, it's generally dull and reminds me of winter - winter in Manchester is a permanent state of grey! But, I'm loving that the dull grey has faded down into this stunning silver, so I'm going to continue to allow it to fade and see where it goes. Who knows, I may even add in a few colours here and there, just to make it a little more customised. Thanks for posting this. 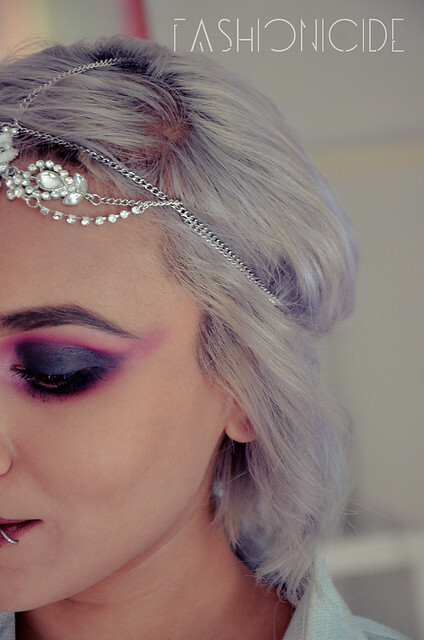 I would LOVE grey hair, it looks so pretty. it turned out so good! You are brave to do it on your own at home. I think it looks gorgeous, but I can understand not wanting all that faff for results that don't last. This is a great post to seeing how you achieved grey. I'm also trying to go grey and I've bought the Wella T-18, Wella 050 and the Pravana Chromasilk Silver. When I watched some Youtube video they would either use the T-18 or 050 to achieve the grey. But as I've read from your journey it doesn't work as well as Pravana. So right now I was wondering if I should use the T-18 just to tone it and then use Pravana? What do you think? Or should I just go all out on the Pravana? Though, there are some part of my hair that isn't pale/white blonde it's still a little bit yellow but close to pale blonde. Hope to hear from you and thanks beforehand! I would just go for the T18 only if your hair needs toning to a cooler tone. After you've rinsed that out, towel dry the hair and apply the Pravana, you could apply it straight from the tube if you want a darker shade of grey or dilute it with white conditioner. Hope this helps! Thanks! This really helped me out with my dilemma! I use wella 050 and yes it fades to blonde. Wish I could get Privana here in the US. Thank you, Donna Zerbe. I wish I could show you a picture of how beautiful my hair looks with wella 050 on virgin hair. Hello! I am new here! I love your page great work! What i would like to ask is if the Pravana hair dye has a better hold on the hair. I wanted to dye my hair grey ( my hair was black before) and i bleached it twice but i think it wasn't blonde enough cause when i used a toner and then the silver from directions it was like i hadn't used them, maybe a little with the toner but slight difference. Soo now i really want to do gray but i am not sure what to do becuse i don't want to vleach my hair for 3rd time.if i directly use Pravana gray will it come out you think? And could it be that the toner that i used wasnt good? i should use to get a pale or ash blonde shade. Wondering, I have some balyaged pieces that are brond, but getting brassier as time goes on. Would the Pravana be a good, longer lasting option than a purple shampoo? I never seem to get the brass out with shampoo and would love a better option.